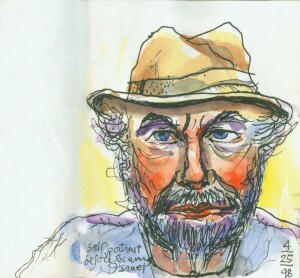 It was late April 1945 and the war in Europe was nearing an end. On April 29, German forces surrendered in Italy. The next day, Adolf Hitler committed suicide. A few days later in Berlin, Soviet forces captured the German Reichstag. As combat to end World War II continued, in San Francisco there was talk of peace and an international solution to future conflict. 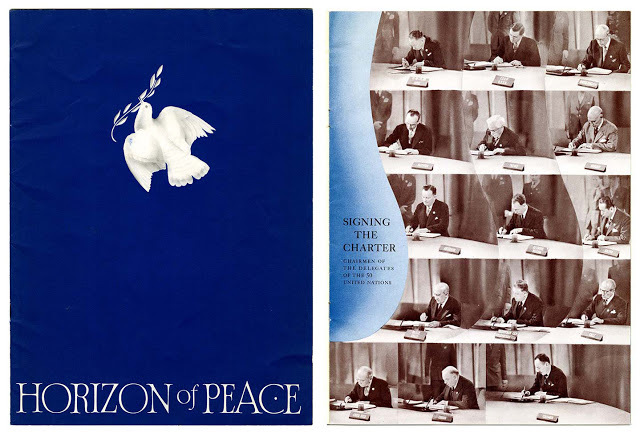 Horizon of Peace cover and “Signing the Charter,” interior page (San Francisco: Bank of America, c. 1945). 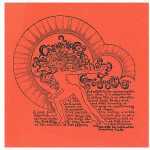 California Historical Society, OV PAM 7288_001. 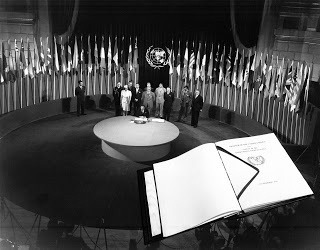 Seventy years ago today, representatives of fifty countries attending the United Nations Conference on International Organizations at the two original buildings of the San Francisco War Memorial signed a charter for the newly established United Nations. 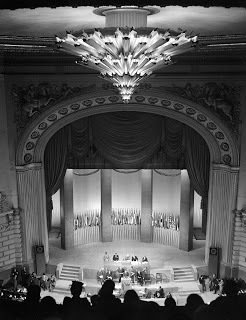 The day marked the culmination of two months—beginning on April 25—of committees and plenary sessions at the San Francisco Opera House. 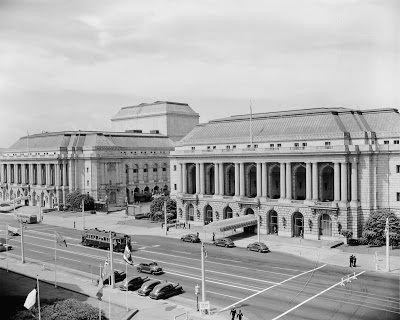 At the conference’s last meeting on June 25, 850 delegates unanimously adopted the 111-article charter and signed it the following day at the Herbst Theatre (now the Veterans Auditorium) in the War Veterans Building. Research Guides / UN Documentation. 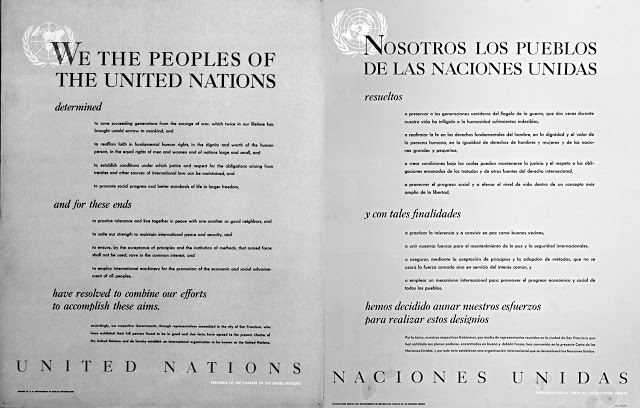 Preamble to the Charter of the United Nations. Dag Hammarskjöld Library / Research Guides / UN Documentation. 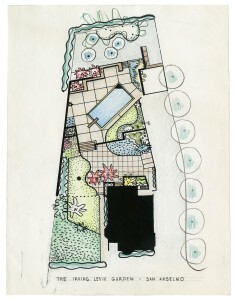 In 1975, U.N. Ambassador Andrew Young dedicated a fountain at the United Nations Plaza in San Francisco’s Civic Center as “a tribute to the U.N.’s goals of seeking peaceful resolutions to international rivalries.” The fountain was designed by renowned San Francisco landscape architect Lawrence Halprin to represent the seven continents of the world. 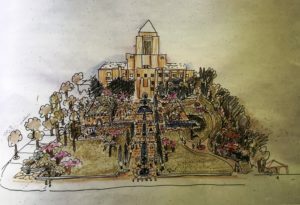 Halprin also designed the U.N. Plaza with architects Mario Ciampi and John Carl Warnecke in commemoration of the thirtieth anniversary of the signing of charter. 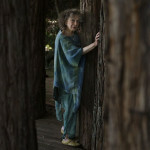 Following many years of decline and in consultation with Halprin, in 1995 the fountain was refurbished and rededicated to commemorate the fiftieth anniversary of the charter’s signing. 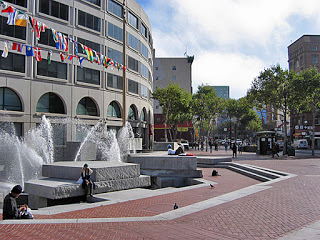 UN Plaza San Francisco, 2005, photograph by Charles Birnbaum. 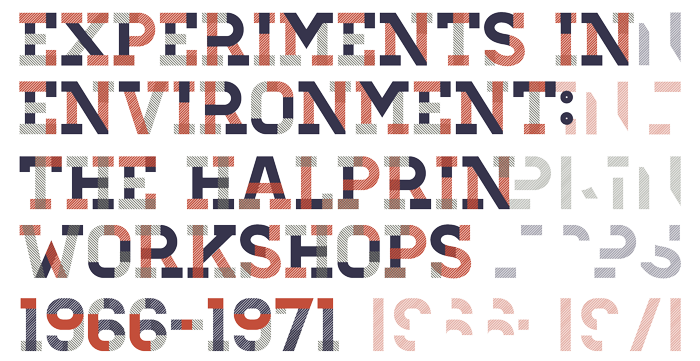 Courtesy, the Cultural Landscape Foundation. 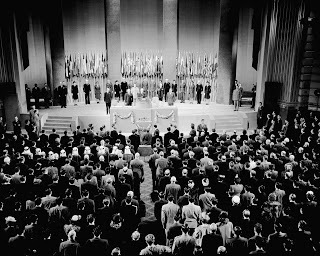 Edward R. Stettinius, Jr., U.S. Secretary of State and chairman of the U.S. delegation, addresses the 16th Plenary Session on June 26, 1945. President Harry S. Truman is to his left. 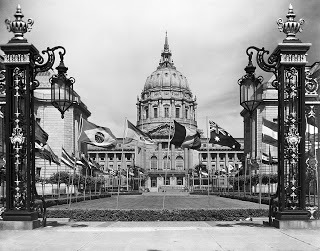 Flags of the United Nations wave in the courtyard of San Francisco City Hall, 1945. Dag Hammarskjöld Library / Research Guides / UN Documentation. 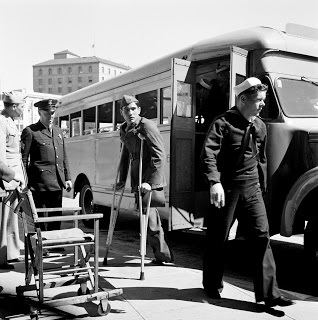 Wounded veterans arrive at the Opera House for the Second Plenary Session on April 27, 1945. 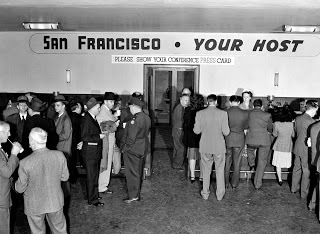 A snack bar in the basement of the Veterans Building served members of the press—a courtesy of the San Francisco Chamber of Commerce and other companies. 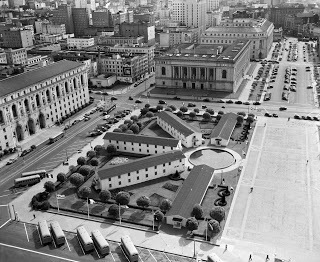 Temporary barracks in front of Civic Auditorium, Barracks B, served as quarters for drivers. 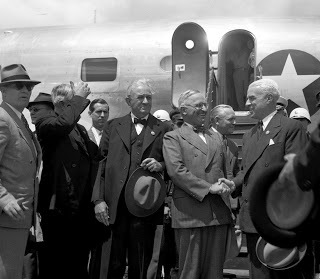 President Harry S. Truman is greeted at the San Francisco airport by Edward R. Stettinius, Jr. (right) and Senator Tom Connally (left), members of the United States delegation. 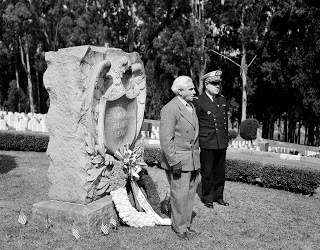 Presentation of the Wreath of Honor on June 6, the anniversary of D-Day, at the Presidio War Memorial by Paul Boncour and Vice Admiral Raymond Fenard of France. 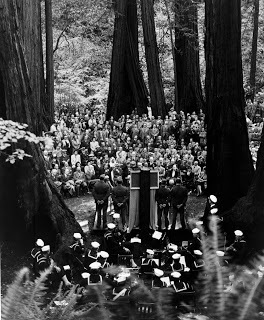 An audience gathered in John Muir Woods at the dedication of the memorial plaque in honor of Franklin Delano Roosevelt. 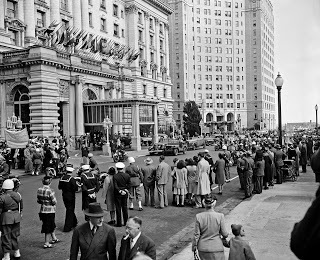 President Truman arrives in San Francisco. 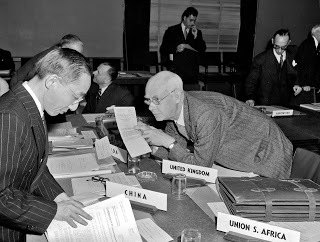 Hsu Mo (left) of China confers with the United Kingdom’s legal advisor and Ambassador to Turkey Sir William Malkin. Chairman of Egypt’s delegation Abdel Hamid Pasha Badawi signs the charter on behalf of his country. A facsimile copy of the charter is superimposed on the photograph.